Writing a resignation letter will often be a bittersweet process. No doubt if you are leaving your job, it will be for good reason. Perhaps you have found a better job prospect somewhere that will offer a better salary and be closer to what you always envisioned doing. Or maybe you’ve just had enough of working where you currently are and need to move on for your own sanity? Either way, something must have motivated you to move on with your life. But that doesn’t necessarily mean that you won’t still have some kind of sentimental attachment to your old place of work. And nor does it mean that you should recklessly burn bridges and cut all ties. 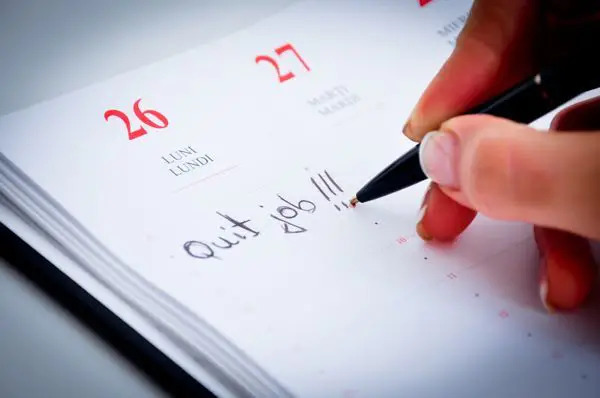 For these reasons, writing a resignation letter is a delicate job and it’s crucial that you remain professional, follow the correct format and don’t allow your emotions to get the better of you. Read on and we’ll look at how to do just that and write a resignation letter that will get the point across in a way that is professional, courteous and effective. Remember when you write your resignation letter that this is not going to need to ‘stand alone’. In other words, it’s very likely that you will also be following up with a discussion, or that a discussion will have preceded the letter. This should not be a surprise for your employer dropped onto their desk out of the blue – make sure that there is some precedent or at least give them the opportunity to discuss the matter subsequently. Note as well that a resignation letter is best delivered in print. Sending a resignation by e-mail is becoming more common but a printed letter is still more official, more polite and easier to keep for your and your employer’s records. If you must send this letter via e-mail, then ensure that you still write it as professionally as you would do any other letter. The first thing to do is to ensure that you include the key facts in your letter. This is first and foremost a practical consideration. As mentioned, you should have discussed the details with your boss already – so there is no need to make this a long-winded letter. You have already had this conversation; the letter simply serves as the written record. By extension, this also means that you don’t need to go into detail explaining why you’re leaving. Apart from the fact that it will read like an excuse/apology (when in fact you have nothing to apologize for), this also isn’t relevant and it won’t look very professional. You should also make sure to include your job title/position and potentially the date from which you’ve been working. When writing a resignation letter, it can sometimes be tempting to include some choice words and criticisms of your employers. This is especially true if you are leaving because of some kind of disagreement, or if you feel you have been strong-armed into doing so. Tempting though it may be to go into detail about just how incompetent your boss is though, it’s crucial that you avoid doing so. Why? For starters, it’s important to remember that you are going to be looking for a reference from this company in the near future. While they can’t legally criticize you directly in a reference, there are nevertheless plenty of ways they can make it clear that you weren’t their favorite employee. What’s more, there’s always a chance you may want to come back to work for that same company again. It might not seem like it now but starting a new job is taking a big leap of faith and having an employer you’re familiar with who is potentially willing to take you back is a very useful safety net. Even if you don’t end up ‘crawling back’, you might still need to get in touch with your old workplace for other reasons and they may be useful contacts down the line. Don’t burn this bridge unnecessarily. Finally, bear in mind that your resignation letter is going to go in your employment file. That means that it can actually be read by future employers. If it isn’t polite, professional and positive then, it could stand in the way of you landing your next job. Try to see your resignation as an opportunity to turn over a new leaf and to start on a positive note. Let bygones be bygones and leave with no hard feelings. When it comes to the writing, grammar and structure of your resignation letter, you need to try and remain professional, detached and objective. Again, leave all personal thoughts, motivations and explanations for any conversations you have in person. This letter should be written as though you have never met the person receiving it. After all, this isn’t just for the benefit of your boss and it will likely be seen by others in the future. This is also why you should include details such as your position and your name. Writing formerly means avoiding abbreviations and colloquialisms (think ‘do not’ instead of ‘don’t’), it means writing in a formal manner (while remaining friendly) and it means using professional vocabulary. Punctuation, grammar and spelling are also important here. While you shouldn’t stress too much over it; you should nevertheless remember that the letter could be seen by future employers and that you thus want to present yourself in a professional and competent manner. Even if no-one else does see the letter, taking the time to ensure that you’ve written it with correct spelling and punctuation shows that you’ve taken time over it and is thus more respectful. Write your letter in MSWord and use the in-built spellcheck and grammar check to identify any potential typos. If you’re really not confident, then ask a friend or relative to look over the letter for you so that an extra pair of eyes have seen it. This is a good idea even if you are confident in your spelling and punctuation – often we can be ‘too close’ to our own writing and this can make it difficult to spot errors. That’s why even professional authors and journalists will always use an editor! You should also make sure that you format your letter correctly. This means having your details at the top, followed by the company’s details, followed by the body of the letter. The signature is important not only to make the letter official but also to add a personal touch. This is one reason why written letters are generally preferable to e-mails. Note that if you are sending your resignation by e-mail, you can always use a digitizer pen in order to sign the screen. If you then save the file as a PDF (you can do this in Word), that will be the most professional way to handle an e-mail resignation. If you’re still fretting over the thought of writing your resignation letter, you can always try using sample resignation letters to guide the process. If you search online then you’ll find that there are plenty of sample letters out there that you can use and which are tailored to suit nearly every situation. All you have to do is read over a few, find one you like and then swap a few words – you don’t want your letter to be exactly the same as Billy’s from accounting who used the same site! I wish to inform you that I am resigning from my current position as [JOB TITLE] at [COMPANY NAME], effective [DATE]. This is includes my two week notice as outlined in my contract. If you have any questions or if I can be of any assistance during this transition, please don’t hesitate to contact me at the details above. Thank you for all your help and support over the last [DURATION] years and for all the opportunities you have afforded me. I wish you all the best in future. This letter is my formal resignation, effective two weeks from today’s date. If you have any questions or require any assistance during my transition, please feel free to get in touch by phone or e-mail. I would like to take this opportunity to thank you and [COMPANY] name for all the opportunities you have provided me with during my [DURATION] years of employment. This was not an easy decision to make and I have greatly enjoyed my time working here. I wish you and [COMPANY] all the best for the future. Note that both these letters take a positive and optimistic tone without going into too much detail or being overly ‘personal’. If the letter feels overly formal, then remember that you can always include personal notes to your teammates and manager as well for their eyes only. While everything we’ve gone over in this guide will apply to the majority of cases, it is important to remember that everyone is different and every situation is different. If you are working for a start-up that you created yourself and you are moving on to more self-employed work for instance, then you may be able to resign with a less formal letter. Likewise, while you don’t normally need to go into detail regarding your reasons for leaving, some circumstances can benefit from this additional information. If you’ll be moving to a new area for instance, then this information may be relevant to help them reach you at a new address. Follow these guidelines then but likewise make sure to be sensitive to the situation and to use a little intuition when deciding how best to approach your particular situation. Remember, this will be read by other people! Finally, before you send your resignation letter, consider the following tips. Don’t act in haste. While things might seem bad, a resignation should not be an overnight decision. Consider alternatives, try speaking to your boss first and make a pros and cons list. Keep a copy for your own records. Likewise, you can also send a follow up e-mail to confirm that the letter was delivered and received by your intended recipient. This way, you will have evidence that you have indeed formally resigned on X date. Be open to negotiation. If you are very valuable to your organization they may offer you a raise or other incentives to stay on. This is another reason not to cut any ties as you might find what they’re offering is an even better deal than what you had in mind. Be brave! Moving to a new job, starting a new business or just leaving your old one can be a scary and potential upsetting experience. Remember though that’ll be moving onto greener pastures and that you have every right to make this decision. Don’t put off handing in your resignation because you’re nervous of the circumstances – once you’ve made up your mind, it’s a little bit like ripping off a plaster. Do it quickly and don’t look back! If you need to refresh your resume, our resume samples might be of help for you.